Jamal to A-G: Drop my case | Daily Express Online, Sabah, Malaysia. 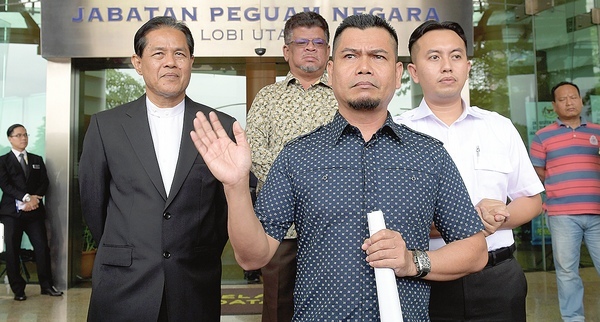 PUTRAJAYA: Sungai Besar Umno division head Datuk Seri Jamal Md Yunos was on Thursday present at the Attorney-General's Office, here, to submit a letter of appeal to the Attorney-General applying for the court case against him to be dropped. The letter was received by the special officer at the Attorney-General's Office, Wasri Ahmad Sujani, as a representative of Attorney- General Tommy Thomas. Jamal, who was accompanied by two lawyers, said currently he was facing three charges while two others were still under investigation. He said the "accommodating" attitude of the Attorney-General by dropping court cases against several individuals such as Rafizi Ramli and Lim Guan Eng had led him to take the opportunity to capitalise on the good nature of the A-G by submitting the letter of appeal. "I am confident that my appeal would be accepted in view of the sensitiveness and concern shown by Tommy since his appointment as Attorney-General," he said. Jamal said those who had been charged or prosecuted in court should take the opportunity to appeal for their cases to be dropped instead of disputing the decision to drop the cases of several individuals following the 'accommodating attitude' of the Attorney-General. Among the charges faced by Jamal were trespassing business premises and escaping from police custody.